Sudbury is an historically fascinating town dating back to the Saxon era with more recent connections to the weaving and silk industries. This market town is located within the Stour Valley, and visitors will discover a number of activities to keep them entertained on their visit - including a wonderful selection of shops, a theatre, river cruises, and a variety of pubs & restaurants. More information on this lovely market town, including details on its history plus the many attractions to tourists that can be found here - guide to Sudbury. There is a good selection of hotels in Sudbury to choose from when visiting the town, and our aim is to help you in your selection. Please click on each Hotel's link for more details and to make a reservation. In the medieval town of Lavenham is The Great House - a period private house that has been lovingly converted into a 5 star French Restaurant with Rooms & boutique hotel. 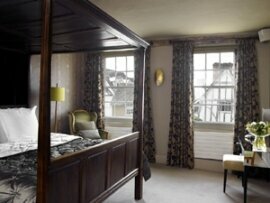 The 5 rooms are elegantly decorated and the complimentary fruit and decanter of sherry offer a welcoming touch. We hope you will enjoy your stay in a hotel in Sudbury. 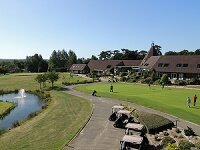 For the current best deals from hotels in Suffolk please see Special Offers from Hotels in Suffolk.